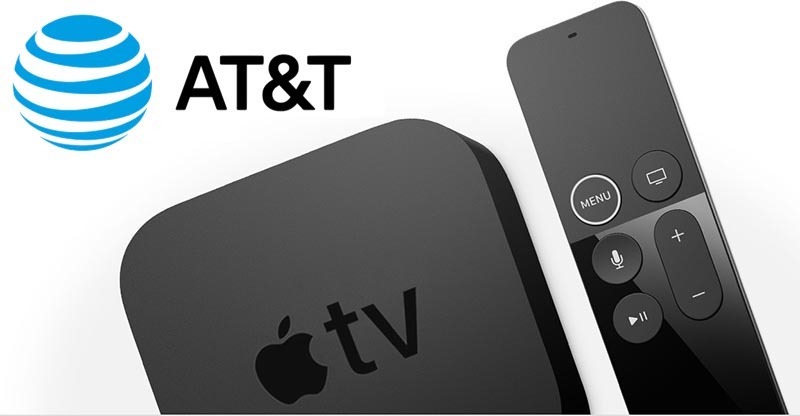 AT&T has kicked off a new Apple TV 4K promotion, this one tied to the company's Fiber Internet service. For the month of February, anyone who signs up for AT&T Fiber Internet 300 or Fiber Internet 1000 will have the chance to get a 32GB Apple TV 4K at no cost. Shoppers should note that the deal is contingent upon AT&T Fiber being available in your area. To get the new deal, head to ATT.com, click "Check Availability," and enter your address. Those eligible for the deal and in an area supported by AT&T Fiber will then see the plans available to purchase. 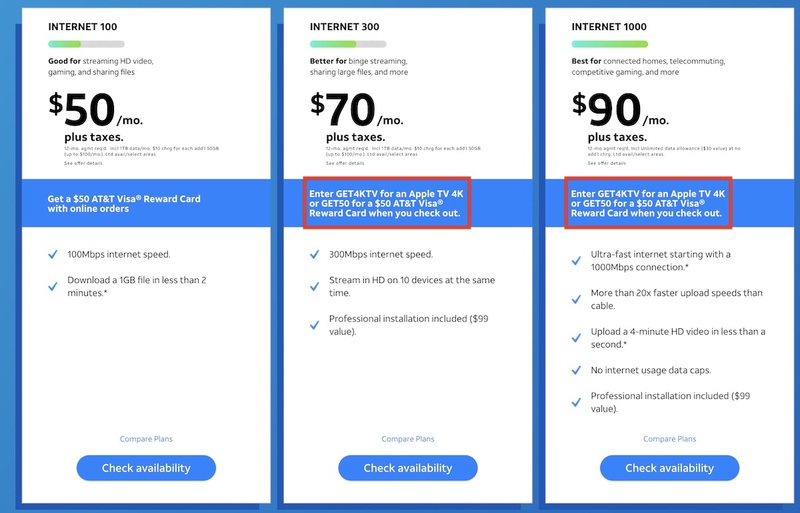 Choose either the 300 Mbps or 1000 Mbps tier, and during the checkout screen enter the promo code GET4KTV to add the Apple TV 4K to your order at no additional cost. If you've been planning to switch to Fiber Internet, AT&T's new promo is a great chance to save a lot of money on a brand-new Apple TV 4K. At 32GB, these models currently sell for around $170 at places like B&H Photo. Anyone interested in the new offer should visit AT&T's website to browse Fiber Internet packages, and be sure to head to our full Deals Roundup to check out more sales happening this week. Data cap = no sale. Internet service with data caps is good for nothing. It doesn’t matter if it’s 100 mb or gigabit. 1 TB is NOTHING! Just two Xbox One X games already use around 200 GB. And those of us streaming a bunch of 4K DV/HDR10 content will blow through that amount in just over a week. And that’s just for entertainment. I have no much idea how data I consume since I’ve always had unlimited data in NYC since my dialup AOL 2.5 days (thank God no Comcast in NYC!). But it’s definitely a couple dozen TB if not more. we live in a world where 100mbps isn't considered much anymore! For those of us that remember 300 baud and thought 2400 baid was amazing I find it humorous that 100 is considered slow. Verizon FIOS Gigabit is $79.99 and comes with cable channels. What am I missing that AT&T thinks will get people to pay more than that for just data? Many areas that have ATT do not have FIOS. Screw you and your data caps ATT. Hard pass. The plans seem to be capped. And worth noting! see below as they mention in their details. I find this practice to be not customer oriented at all. Over the last few years we′ve experienced a dramatic increase in the amount of data being sent over our network. Most of this increase has been driven by only a small percentage of our network′s users. So to keep the online experience as optimal as possible for all of our customers, each of our Internet plans comes with a monthly data allowance. Our data plans offer far more bandwidth than the average person ever uses. If you get close to your monthly data allowance, we′ll notify you several times. If you happen to exceed your data allowance for a third time, we′ll automatically add 50GB for $10 to your monthly data limit, not to exceed a maximum of $100." I wished I had more options where I live. It's basically Spectrum and AT&T (no fiber). So I am stuck with Spectrum for many years already. FIOS would be nice to break the monopoly but I don't see this changing anytime soon.